Head UA diving coach Omar Ojeda trains a critical eye on a diver at the Hillenbrand Aquatic Center during a 2016 practice. University of Arizona diving coach Omar Ojeda, working with diver Karolyn Loftus at the UA’s Hillenbrand Aquatic Center, is easygoing when he’s not coaching. Poolside, he is all business. Omar Ojeda, of Mexico, makes a dive during the men’s 3-meter springboard competition at the U.S. Diving Grand Prix swimming championships, Thursday, May 10, 2007, in Fort Lauderdale, Fla.
Ojeda, who dove at the University of Arizona from 2000-2002, holds four school records and remains the most decorated male diver in UA history. 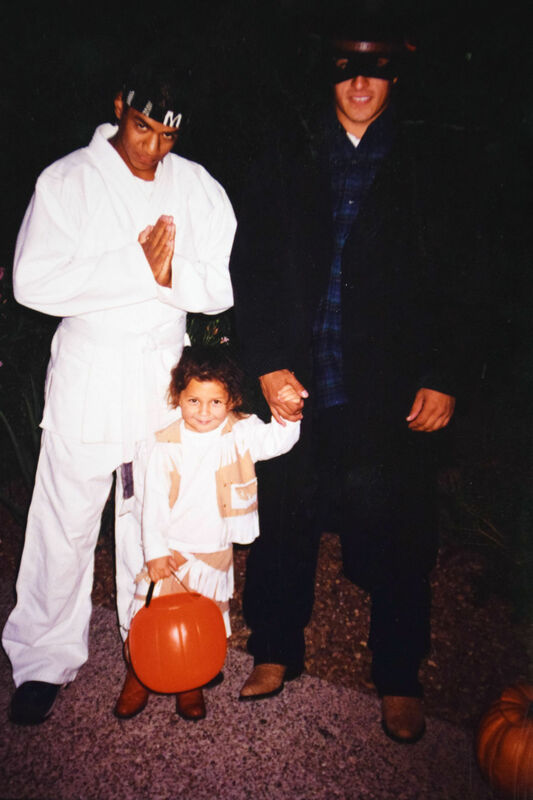 During his first year diving for the University of Arizona in 2000, Omar Ojeda (left) and teammate Ruben Vaca (right) took coach Michele Mitchell’s daughter trick-or-treating on their first Halloween. His coaches and teammates became a second family while he was away from home. Omar Ojeda is calm as he watches Rafael Quintero jump off a 10-meter concrete platform, twist one and a half times, extend into a plank and hurtle toward the water. The instant Quintero hits the surface, Ojeda knows it was a great dive — one that could secure the young diver’s spot in the 2016 Olympics in Rio de Janeiro. But he won’t get excited yet. He knows that in diving, as in life, anything can happen. Ojeda, 36, is the University of Arizona’s head diving coach. He is also a 17-time Mexican national champion, a five-time World University Games medalist and the most decorated male diver in UA history. Since he started competing internationally at 11 years old, his dream was to dive in the Olympic Games. Despite qualifying in 2004 and coming close in 2000 and 2008, he never made it. However, his talents as a diver and coach led him back to the University of Arizona under a coveted visa for immigrants with extraordinary abilities, giving him another chance at his dream. This time as an Olympic coach. Ojeda was 8 when diving called to him. The youngest of three children, he started swimming lessons because his mother feared he would drown on family trips from their home in Mexico City to the beach town of Acapulco, where he was born. Each week after his lesson, he would go to his sister’s synchronized swimming practice, where he watched divers training in the pool. “That’s when I realized I loved diving,” he says. Diving isn’t only a difficult sport, it’s an art, he says. It takes talent, practice, dedication. It requires sacrifice and mental strength. Reyna Guzman tried to discourage her youngest son; too dangerous, she thought. Divers launch themselves off platforms high above the ground, their heads spinning toward the concrete edge. She took him to football, karate, track. But his heart was set. Finally, she gave in. Omar wants to dive, she told the coach. Only he doesn’t know how to swim. Omar took to the sport immediately. It was exhilarating — the perfect combination of danger and fun for a little boy as inquieto, restless, as he was. He entered his first competition when he was 10 years old. By the time he was 12 he took fourth place in the Central American Games. “It’s just that built-in competitive gene where competition is not something that is scary, it’s something that is exciting,” says Mitchell, now the director of operations for UA diving. That mental strength under the pressure of high-stakes dives is what sets the best apart, she said. Ojeda had it. Before every dive, he would look at his coach from the diving board, make eye contact with his mother and jump. “I liked to show off,” he says with a smile. He enjoyed being the center of attention, but diving isn’t just about going to meets and winning titles. Most of his days were spent training. At 9 years old, he practiced four hours every day after school. During vacations he was at the pool from morning to night, only taking a break for lunch. Diving was his life, and his team was his second family. His passion for the sport meant he made quick progress, but it also meant not having birthday parties. Not going out with his friends. Not attending family gatherings. When his only sister got married, he wasn’t there. His dedication paid off. When he was 19, he took second place at the Mexican Olympic trials. He expected that would be enough to land a spot on his country’s 2000 Olympic diving team, but internal politics trumped his score. Sometimes, how well you dive isn’t as important as which team you’re on. An offer came to dive for the University of Arizona. Ojeda barely spoke English when he arrived at the UA in 2000. It was his first time living away from home, where his clothes were always clean, his dinner was always ready and the only thing he worried about was diving. Here, everything was harder than expected. Even the sweltering summer was tough to get used to. Ojeda was studying harder than ever, but he couldn’t keep up. In one class he didn’t realize there were online quizzes until weeks into the semester. By then, he was failing. He finished his first semester on academic probation. Instead of going home over winter break, he had to stay on campus to take two more classes and have knee surgery for a diving injury. The diving board was the only place he felt at home. By the end of the winter term, Ojeda had brought his grades up. His English was improving and his knee was recovering. That year he finished second and third at nationals. At the University of Arizona he was a five-time NCAA All-American and the Pac-10 diver of the year in 2001 and 2002. He was inducted into the UA Hall of Fame in 2008 and still holds four school records. When he graduated in 2002, he decided to go back to Mexico to give the Olympics another shot. Two years later, he made it, placing within the top 18 divers in the 2004 World Cup qualifier. But again, he says, internal politics got in the way, and he lost his spot. He took several months away from the diving board, then went back to work with his eye on the 2008 Olympics. His last shot. The continued impact of hitting the water, high speeds and repetitive movement puts a lot of stress on divers’ joints. Most retire by their late 20s. Ojeda was 28 with prior knee and shoulder injuries. He did well in the 2008 World Cup, but not well enough. He missed making the Mexican Olympic team for the third time, bringing his diving career to an end. Still, he finished in the top 10 in the world, his biggest accomplishment. Ojeda’s coach on the Mexican national team asked him to stay on as her assistant. Coaching came naturally. Without really knowing it, he had been coaching since he was a diver. He worked with the Mexican national team for four years, coaching several national and international champions and creating a program for children to bring new talent to the team. His success caught the attention of the Colombian government, and he was asked to lead its national team. Then his alma mater called. He had kept in touch with his former UA coach, and when Mitchell was promoted to director of operations in 2011, she encouraged him to apply for the head coaching position. He was the UA’s first choice. A team of promising young divers awaited him, if he wanted it. Coaching at a university was a dream job. Returning to Arizona made it that much sweeter. Ojeda had been a great diver. Now he wanted to be an exceptional coach. But the pattern continued: With good news came complications. The university sponsored Ojeda to come with a work visa, but once he arrived in Tucson there was a problem with the paperwork, and he couldn’t coach. One month turned into five as his lawyers tried to secure his legal status. He had used up his savings, quit his job with the Mexican team and passed up the position in Colombia. He started to consider a Plan B: performing in diving shows in China, where he’d lived for a year while coaching with the Mexican national team. Than finally, after months of waiting, Ojeda received a visa as an “Alien of Extraordinary Ability.” Given to those who can prove their accomplishments are truly unmatched, the visa is awarded to less than 1 percent of all legal immigrants. In 2013, only about 3,500 of nearly 1 million immigrants came under that visa. He could start training champions at the UA. For someone so passionate about diving, Ojeda comes off as reserved when he is coaching. At first, his lack of emotion was a big adjustment for the divers. “I would describe him as, maybe, very Steady Eddie,” says Samantha Pickens, who started diving with Ojeda when she was a sophomore and will go with him to Olympic trials this June. When he’s not coaching, Ojeda is easygoing and likes to laugh, she says. Practice is quiet. The divers know the routine: Dive. Listen. Repeat. One by one they spring off the diving board, twist and spin through the air, then glide into the water, leaving hardly a ripple behind. Ojeda, who recently got his permanent resident card based on his extraordinary abilities, stands at the side of the pool taking note of their every move. He tells them what to fix. Nothing more. He knows what his divers need to do to reach their potential, and that’s why they’re here. If you want to have fun, go to the amusement park, he tells them. When you’re at practice, you work. And that work gets results. His second goal: be an Olympic coach. This year, three of his athletes have the chance to qualify for the 2016 Olympic Games in Rio de Janeiro, Brazil. In February, Ojeda and Quintero went to the World Cup in Rio de Janeiro, where the top 18 divers qualify to dive in the Olympics. Ojeda was confident Quintero could qualify. He wasn’t nervous. But he also didn’t want to get his hopes up. But it was Quintero’s day. He performed six strong dives in the World Cup prelims. When the final scores were posted, he finished eighth, qualifying to represent his native Puerto Rico in the Olympics this summer in Brazil. Ojeda will be right next to him, as his coach. But making the Olympics is just the beginning of his coaching career, Ojeda says. He’s already working toward his next goal: becoming the best coach in the world. Kendal Blust is a University of Arizona journalism student who is an apprentice at the Star. Contact her at starapprentice@tucson.com.